We posted here about the downtown Tampa cronies who are collaborating to control billions of taxpayer dollars. 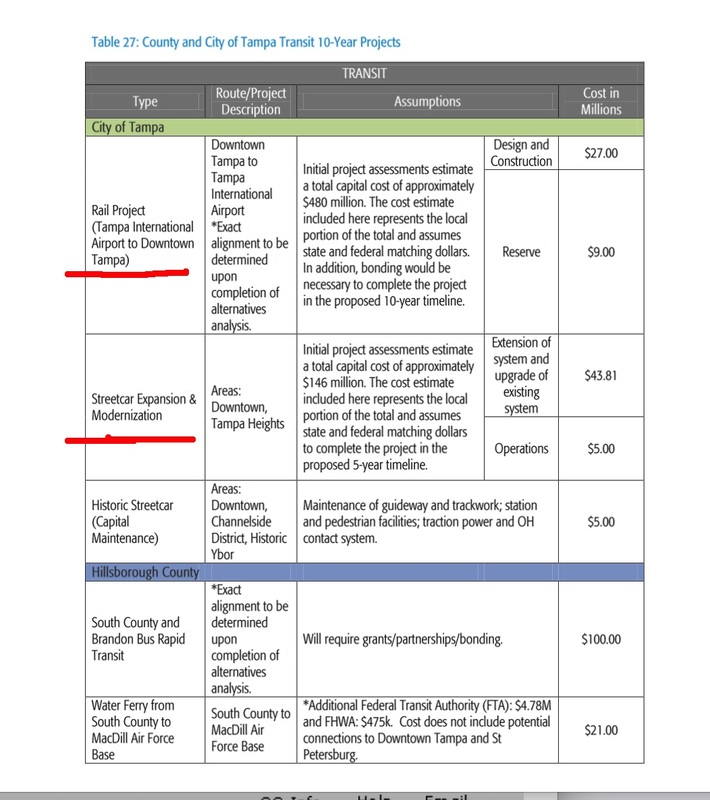 Five donors, all connected to Jeff Vinik, contributed $150K each to Vinik's transit tax hike PAC All for Transportation (AFT) to advance their collaborative agenda. With $750K in the bank, where has Vinik's AFT PAC money been spent? 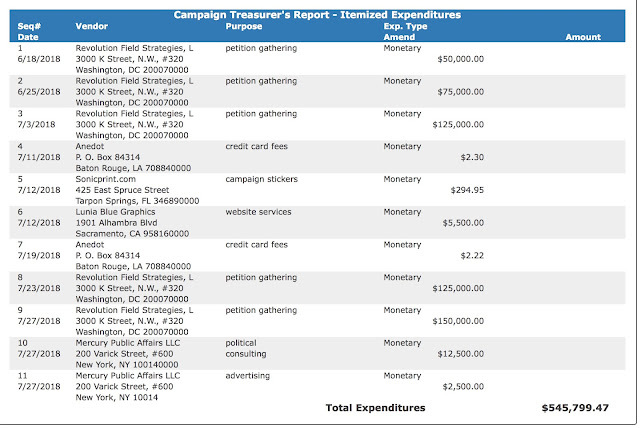 Below are the expenditures reported by AFT through their latest campaign filing. 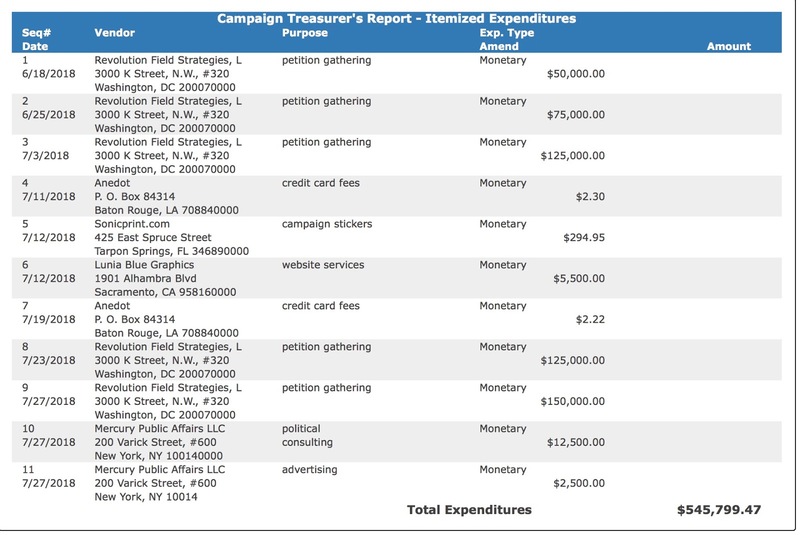 $525K was spent paying Revolution Field Strategies who paid petition gatherers to collect petition signatures. Revolution Field Strategies website states they lead "grassroots" campaigns. Obviously that is not always true. This petition campaign, funded by five deep pocketed special interests who are all connected to Jeff Vinik, is anything but grassroots. Another $15K was spent with Mercury PR firm. We understand Mercury is working with the campaign of Jane Castor who is running in Tampa's mayoral race. And who donated to Castor's campaign according to the SOE website? Sykes. Mercury PR firm sound familiar? Go back to the Go Hillsborough (GH) debacle. It makes sense Mercury is working on Jane Castor's campaign because Ana Cruz is Jane Castor's partner. She is also the daughter of Democrat state rep Janet Cruz who originally filed to run for county commission but then jumped over to run against incumbent Republican state senator Dana Young. Maybe Cruz jumped ship out of the commission race because she knew Vinik's transit tax hike was a power grab by Tampa and usurps the power of county commissioners for 30 years. We knew then and we know today who those unidentified business interests sitting in the shadows were who funded the poll. That Mercury poll in 2016 was for the proposed GH one-half percent sales tax hike and no formal opposition was ever in place. The polling on a one percent sales tax hike was polling about 30% or lower. Which confirms just how greedy the Vinik tax hike cartel are. Mercury wanted the lucrative advocacy campaign for the crony GH tax hike so bad they did a poll funded by the very cronies who would dump millions into the advocacy campaign to benefit them all. Of course Mercury got the polling answer to help get them the campaign work they wanted. Sound familiar? That was a lie then and it's a lie now. The only reason Vinik demands a 30 year 14% massive transit tax hike is to fund costly rail in Tampa and fund all of it. 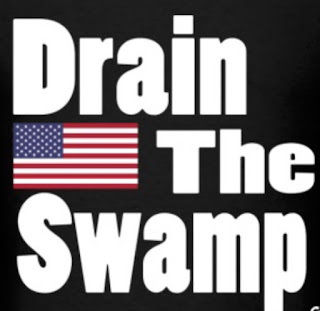 The cronies are not planning to go to the Feds for funding because the cost is too high and the ridership too low to qualify for federal money. Vinik and his downtown Tampa allies plan to fund the ENTIRE cost of the costly trains in Tampa with YOUR COUNTY TAX DOLLARS - most of which will come from unincorporated Hillsborough County. Of course, Kieran Mahoney, the CEO of Mercury PR firm, donates to Tax Hike Hagan because Hagan has not seen a proposed sales tax hike in over a decade that he has not supported. Special interests keep circling money thru PAC's, PR firms and campaign coffers to push massive tax hikes that benefit them. Expect Vinik and his special interests allies to dump $5-10 million into Mercury and perhaps some other PR firms over the next 90 days. With the Vinik owned media megaphone, they will drown out everything and everyone as if nothing else exists but their own greedy egregious massive tax hike. It is a big circle of money!